From director Asif Kapadia (SENNA), AMY tells the incredible story of six-time Grammy-winner Amy Winehouse – in her own words. Featuring extensive unseen archive footage and previously unheard tracks, this strikingly modern, moving and vital film shines a light on our culture the world we live in today. A once-in-a-generation talent, Amy Winehouse was a musician that captured the world’s attention with her unforgettable voice and charisma. The combination of her raw honesty and virtuosity resulted in some of the most unique and adored songs of our time. 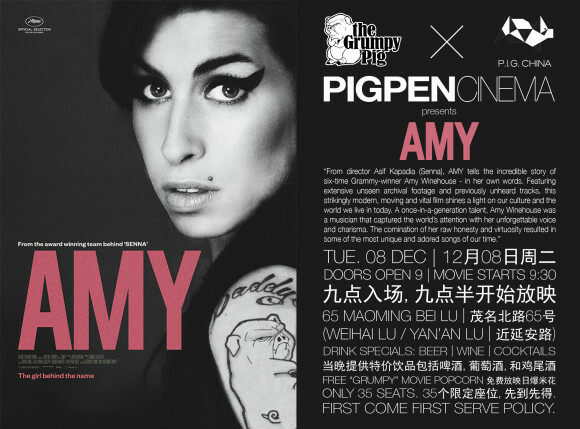 A blog on moving images & digital creativity in and around China (from the offices of PIG China) - read more here.